About the size of a school bus, the Hubble Space Telescope has an 8-foot (2.4-meter) primary mirror. The largest optical telescope ever launched into space, where it could observe the universe free from the distorting effects of Earth’s atmosphere, Hubble had a lot riding on it. But after the first images were obtained and carefully analyzed following the telescope’s deployment on April 25, 1990, it was clear that something was wrong: The images were blurry. Astronomers and engineers rallied to study a variety of solutions to the problem, and NASA convened an independent committee to find the source. They all came to the same conclusion: Hubble’s primary mirror, which looks like a very shallow bowl, had been polished into the wrong shape. The error was smaller than the width of a human hair, but the effect was significant. If the error went uncorrected, Hubble would never reach its full potential. During the week of Dec. 6, 1993, the astronaut crew installed two pieces of hardware intended to fix the error. The Corrective Optics Space Telescope Axial Replacement (COSTAR) was designed and built by a team at NASA’s Goddard Spaceflight Center, and would correct for the mirror error in three of the five instruments on Hubble. The second instrument was the Wide Field and Planetary Camera 2 (WFPC2), designed and built at NASA’s Jet Propulsion Laboratory in Pasadena, California. WFPC2, which actually contains four cameras, would go on to produce many of Hubble’s breathtaking images, helping transform our view of the cosmos. The size of baby grand piano, the instrument imaged objects and events that occurred in our own solar system – such as comet Shoemaker-Levy 9’s crash into Jupiter – to the most distant cosmological images that had ever been taken in visible light. It generated breathtaking snapshots of galaxies, exploded stars and nebulae where new stars are born. During the instrument’s tenure, Hubble managers pointed the telescope at a single, black patch of sky for more than a week and found thousands of previously unseen galaxies. “The promise of the Hubble program, the application of our best technology to push back the frontiers of astronomy, had been instantly transformed in the public eye to an icon of technical failure,” Trauger wrote in an essay in 2007. Trauger brought his team together to work the problem. The telescope’s primary and secondary mirrors collected light and fed it to the five onboard science instruments. The primary mirror could not be replaced and could not be returned to Earth for repairs. A solution would have to be found for each of Hubble’s instruments. The COSTAR device provided corrective optics for three of them, eliminating the need to fully replace those instruments. But the same approach wouldn’t work for the telescope’s Wide Field and Planetary Camera (WFPC), the predecessor of WFPC2. Trauger and his team came up with a potential solution. The primary mirror error caused light striking different parts of the mirror to come into focus at different locations, so the team had to figure out how to redirect it to the appropriate focal point. Their solution was to reverse-engineer the problem: They would place four identical nickel-sized mirrors inside the instrument – one for each of the four cameras inside WFPC2 – with the same error as the flawed primary mirror, but where the primary mirror was too flat, the new mirrors would be curved too deeply. Together, these two errors would cancel each other, producing the equivalent of a single mirror with the correct shape. NASA accepted JPL’s proposal to build a WFPC replacement. The agency had planned to carry out Hubble repair missions every three years and decided to maintain this schedule. The first repair mission was set for the fall of 1993. JPL would need to deliver the replacement by the winter of 1992 – just over 2 years away. The race to repair Hubble was on. Two years was nowhere near enough time to build a new camera instrument from scratch. Thankfully, WFPC2 was already under construction at JPL; NASA had intended to eventually use it as an upgrade for WFPC or a replacement if the instrument ever failed. Even with work on WFPC2 already under way, the deadline required an accelerated schedule. Dave Rodgers and Larry Simmons, the WFPC2 project managers, held daily meetings with the leaders of each of WFPC2’s several components to help stay on target. While the corrective mirrors were small, they affected nearly every step of the building process and created “an endless string of novel problems,” according to Trauger. To minimize the chance for error during WFPC2’s installation in low-Earth orbit, the seven astronauts who were scheduled to execute the repair mission traveled to JPL to learn about the instrument and be trained on how to install it. They would be inserting WFPC2 into a cavity in the telescope’s body, as if sliding it in a drawer. And although they would need to make sure that the electrical connections at the back of the instrument were secure, they had no way of reaching those connections; they could control only how they inserted the instrument. The leaders of the WFPC2 team traveled to NASA’s Kennedy Space Center in Florida for the early morning launch on Dec. 2, 1993. After departing Kennedy and seeking out an early breakfast, Gallagher remembers looking up at the predawn sky to see the space shuttle passing overhead and nearing Hubble; the objects appeared as two faint points of light in the sky as they orbited Earth. 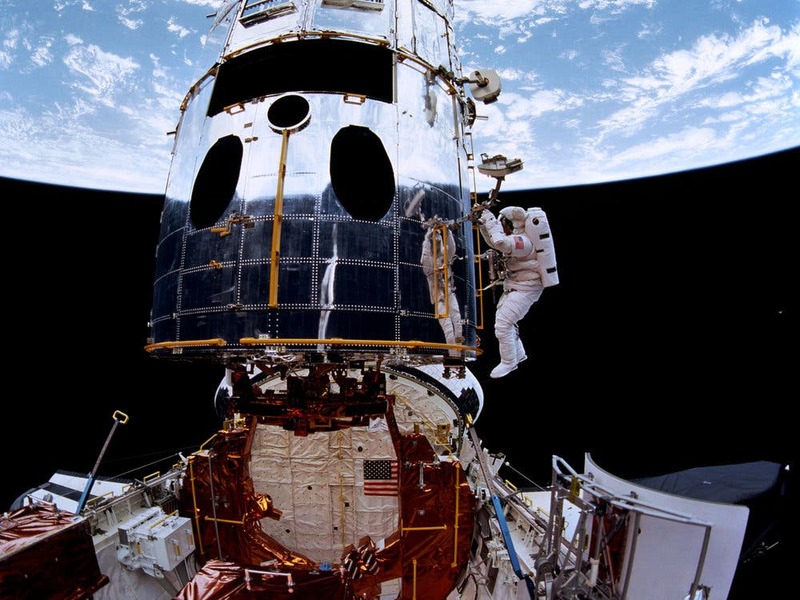 On the sixth day of the mission, astronauts Jeffrey Hoffman and Story Musgrave conducted a spacewalk to remove WFPC from Hubble and install WFPC2. Everything seemed to go as planned, but the real test was yet to come. The astronauts returned to Earth on Dec. 13, and the first raw data from WFPC2 came back on Dec. 18. The team put the data through the image-processing software and watched anxiously as the pictures began to ratchet across the screen. There was instant relief. NASA released those first images to the public on Jan. 13, 1994. The next day, the WFPC2 team presented the results to an overflow audience at the winter meeting of the American Astronomical Society. The WFPC2 instrument operated on Hubble for over 15 years and took more than 135,000 observations of the universe. More than 3,500 science papers were written based on that data before the instrument was retired in 2009, and over 2,000 more have been published since. In May of 2009, astronauts removed WFPC2 from Hubble and replaced it with the Wide Field Camera 3 (WFC3), which continues to operate today – 28 years after Hubble first switched on. WFPC2 was later placed on public display at the Smithsonian Air and Space Museum in Washington, D.C.